Something surprising has arisen from all of these limited edition aprons I've been sewing from my fabric stash. After being so used to sewing multiples, I fully expected to be annoyed at having to make one at a time. 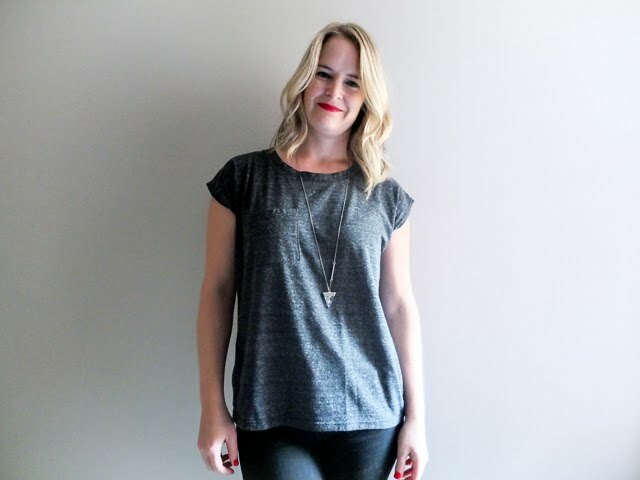 However, all the extra time and effort that comes with physically sewing a unique piece is of no matter when you consider all the fun you can have designing a unique item. When you don't have to consider recreating a design element hundreds of times, your creativity is suddenly given some room to breathe and experiment and play! I don't know the last time I felt that way about sewing. And I've found myself turning to apron, needlework and even business books to add fuel to the fire, so to speak. Here are some of my favourites. This book is a bit of a mishmash of history, anecdotes, sewing patterns, household tips and recipes. 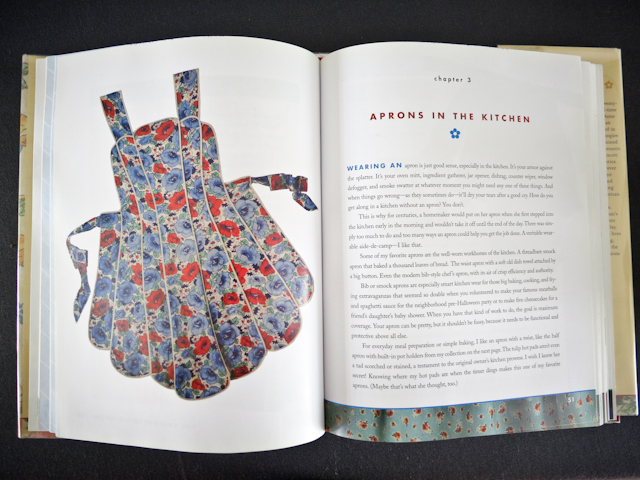 I especially loved all the personal memories shared throughout of mothers, grandmothers and even fathers tying on aprons, reinforcing the idea that aprons are so much more than a practical houseware. 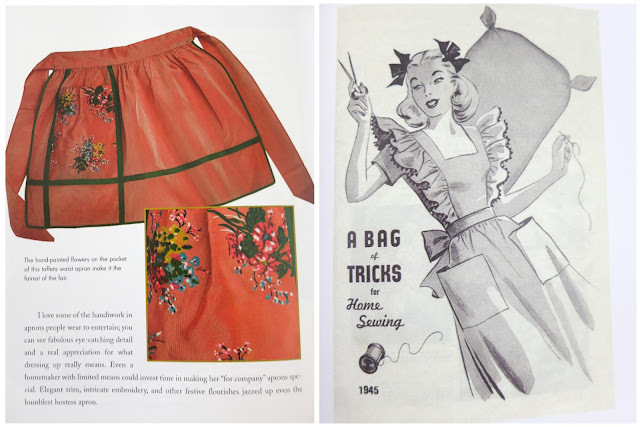 This book is more of a how-to book for sewing various kinds of aprons, so I was pretty quick to dismiss it, that is until I discovered the vintage apron section. 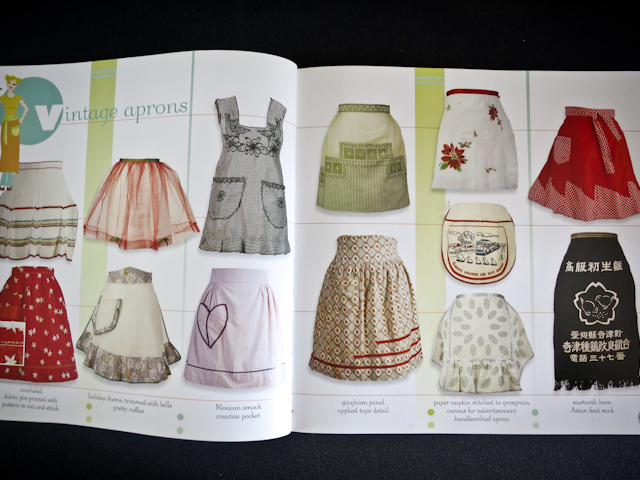 Six glorious pages of bright patterns, ruffles upon ruffles, delicate embroidery, and tulip pockets. This is what I turn to most often when I want to add a little something extra to an apron. They sure don't make them like they used to. 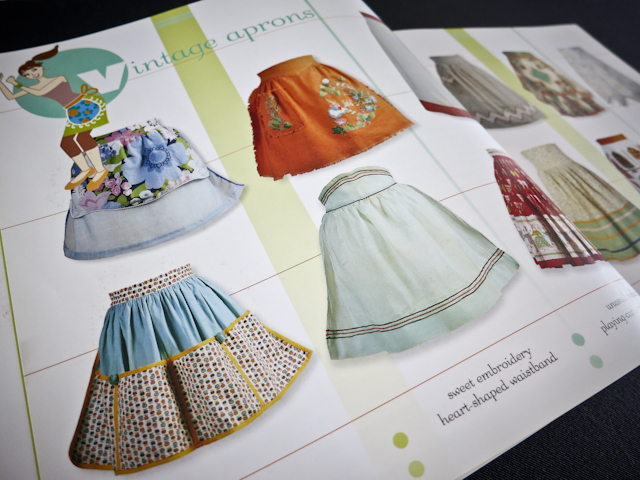 Seeing all these beautifully embellished vintage aprons has be yearning to add a similar touch to mine. Mikey J bought me this book for Christmas and it has been an invaluable resource for everything from identifying types of fabric to quilting to intricate lacework. 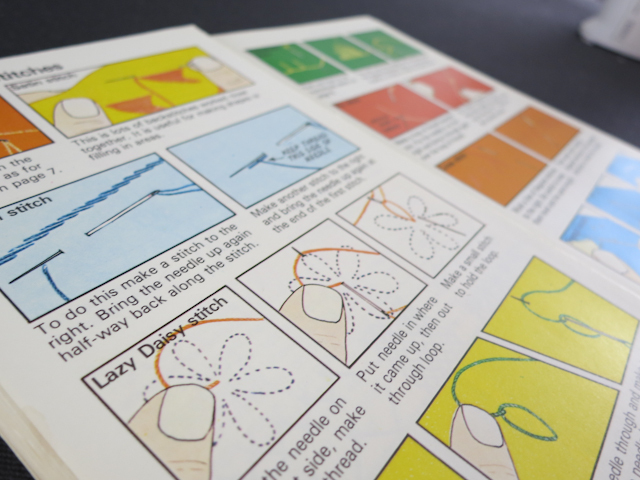 Lately, I've been absorbed in the needlework section. So pretty. This is a tiny 7x5 pocketbook that I inherited, I believe from the woman who gave me my first sewing machine. 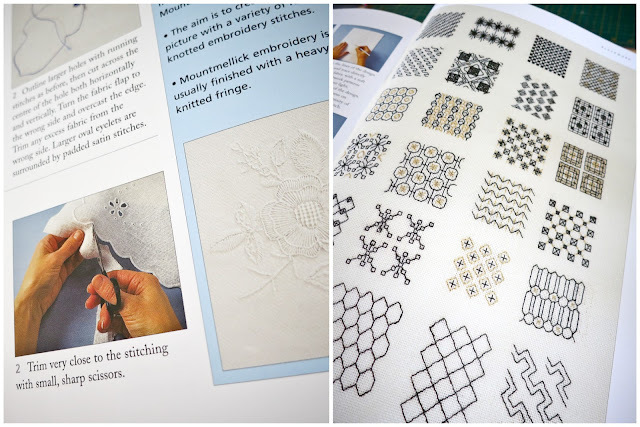 It covers everything that is in the book above, plus knitting and crochet, in 64 hand-illustrated pages. Haha! Obviously these are extremely condensed overviews, but there's something quaint about it that keeps me coming back for more. It's a much more portable resource, that's for sure. 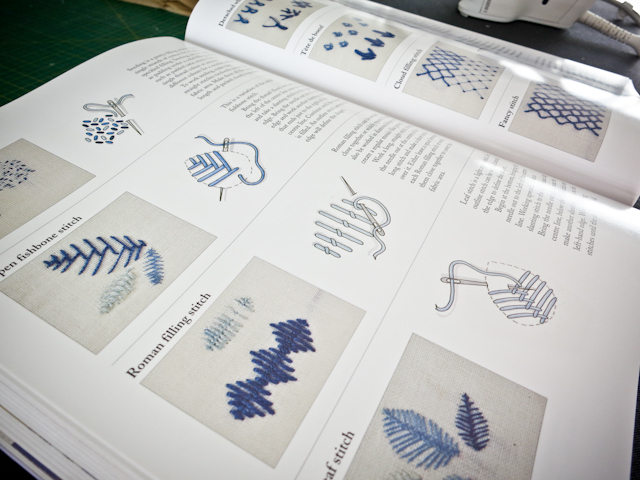 This book has nothing to do with sewing or aprons, but it's no less interesting or inspiring to me. 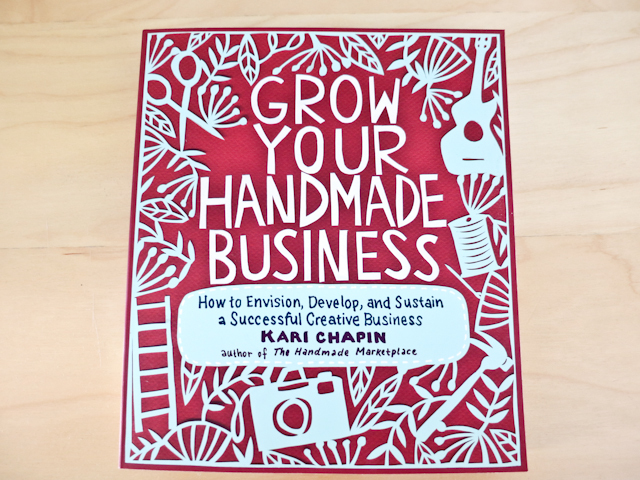 I loved Kari Chapin's first book, The Handmade Marketplace, which is all about starting to sell your handmade crafts, so I knew I needed her sequel about growing said business. The timing is so perfect, it's like she's writing these for me! I'm only a few chapters in, but so far I'm impressed with the sheer amount of information. 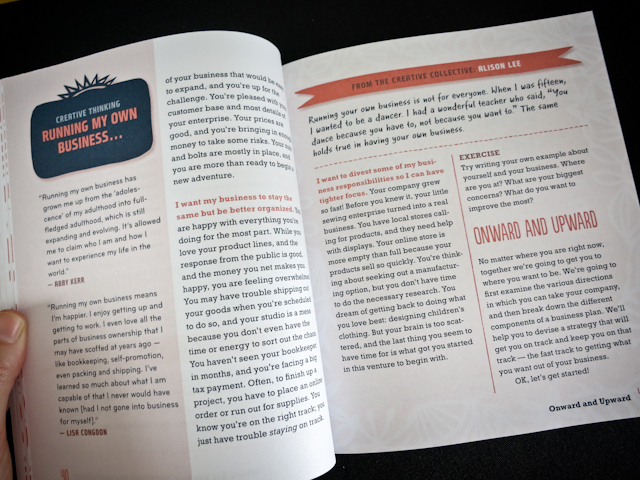 This is the meat and potatoes of business books and I can't wait to dive in! I'm off to Montreal this weekend and you can be sure I'll be packing a couple of these. Now that I'm through The Hunger Games, I can give them my undivided attention.